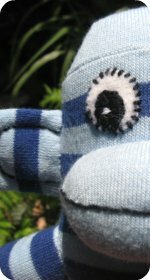 There are so many cool sock monkeys for sale and lots of other monkey and sock things. The more I look around for monkey and sock items, the more I am amazed at where I find them. Instead of buying something pre-made you can make your own. Whether you are looking for a sock purse, a toy for your pet or maybe even a super groovy monkey wine cover (who thought of that one), you'll be able to find them somewhere. I do enjoy it whenever I find anything that looks appealing (or just down right funny) that is monkey or sock orientated. Oh, the things we do to entertain ourselves! Anyway, back to business. Below you will find a list of some of the things you'll find out there. Better yet how to make or personalize some of your own creations. 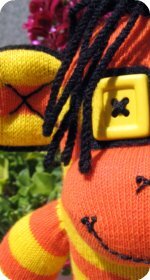 Sock Monkey Accessories : sock monkey toys, sock animals, clip-ons, sock monkey night lights, sock monkey theaters, monkey puppets, sock monkey clothes, totes, furniture: tables and chairs, and banana car. 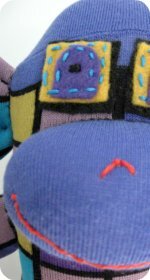 Catnip Toys, sock animals for cats : Catnip cat toys. Easy to make, just stuff some catnip herb in your sock creation. Monkey Check Books : unique sock monkey check books, check book covers and fun address labels. Monkey Clocks : personalize your own clock. There are a few styles to choose from wall, mantle and desk clocks. 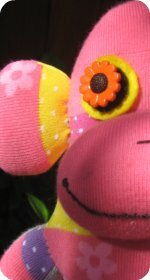 Monkey Dog Toy : Cool Booda crinkle critters sock monkey dog toys and Sock Pals Multipet dog toys. Monkey Table Lamp and Night Lights : sock monkey night lights and monkey table lamp. Fun, whimsical ways to light a room. Paul Frank Purse, Wallet and Handbag Range : Fun Paul Frank Julius girls purses, kids coin purse and ladies wallets. Julius will help you carry your stuff with style. Sock Coin Purse : Cute baby sock coin purse, a funky snap coin purse range that is just the cutest way to store your spare change or to pop a key in! 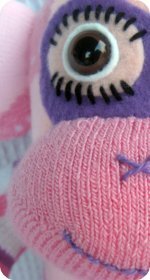 Sock Monkey Clothing (for sock monkeys) : Delightful sock monkey toy clothing range. Fun monkey clothes designed to fit 14" sock monkey dolls. Sock Monkey Ornament : The coolest vintage looking sock monkey ornament dolls. These mini sock monkey ornaments look so homey on the Christmas tree.